When is too many markets not nearly enough? Well, apparently when they are in Liverpool. There is no other suburb in Sydney that can match the sheer quantity of market stalls available every weekend. The three major markets; the Warwick Farm Trackside Markets, Liverpool Markets and the Trash and Treasure Markets at Prestons feature hundreds of stalls most of which dependably set up every week while others are somewhat more transitory. 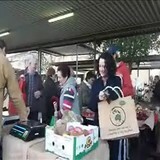 The only farmer's market in Sydney actually run by farmers is held every Saturday morning at Warwick Farm Racecourse. The Trackside Markets attract local growers from around Sydney who sell their fresh seasonal produce direct to the public. There's an incredible array of potatoes, leafy and hard vegetables, meat, tomatoes, cucumbers, eggs, cut flowers along with more seasonal produce such as strawberries, mulberries, raspberries, stone-fruits, apples and oranges. There are also several stalls selling cakes, biscuits, pies, jams and chutneys, gourmet breads, olive oil and soap products. Munch on an egg and bacon roll cooked up by the local Lions Club and wash it down with a cup of freshly ground Byron Bay coffee. Open every Saturday 8.00am to 12.00pm. Address: Governor Macquarie Drive Warwick Farm. Bargain hunters might want to head to the sprawling outdoor Trash and Treasure Markets at Prestons on Sundays. It not only attracts the typical up-market arts and crafts vendors and the usual range of stall holders but a lot of mum and dad stalls selling second hand items. It's rather like going to several garage sales all conveniently situated in the one location. There's fresh local produce and a range of hot takeaway food. The sheer diversity of stalls from week to week means that trash and treasure markets truly offers one of the more unique shopping experiences in Sydney. A small entry fee of $1.80 applies, free for children under 15. The market is also open Wednesdays and entry is free. Address: 1895 Camden Valley way Prestons. Look for the Arab castle Grand Bazaar. Every Saturday and Sunday, this massive undercover air-conditioned markets are the Sydney's southwest equivalent of Paddy's market. There is a huge range of stall holders selling fresh fruit and vegetables, electronics, furniture, carpets, pets, perfume, home goods, mobile phones and accessories, clothing, toys, DVDs, jewelery, shoes and tools. Indulge in some Golzeme, Peruvian chicken dishes and much, much more. For children, there is a large indoor slide. Integrated with the Liverpool Mega centre next door, the Liverpool Markets are more like a family outing than just a place to shop.